Motion Chart is a free interactive chart in Google Spreadsheet (an online spreadsheet similar to excel). In motion chart you can convert your data-series into a Gapminder-like graph and put it on your web-page or blog. All you need is a free Google account. 1. Go to drive.google.com and log in to your Google account. 4. Following columns are for your data (e.g. 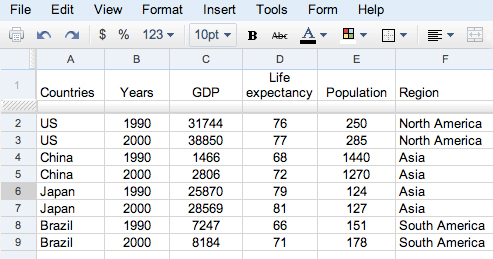 life expectancy, GDP, population). The value in these columns can be numbers or texts. If you use only numbers, this column will appear on x- and y-axis as well as bubble-size and the menu for colour. If you have a text-string it will only appear in the drop down menu for colour. ◦ Year – Example: 2008. ◦ Week number – Example: ‘2008W03’. ◦ Quarter – Example: ‘2008Q3’.